Blown out of the sky on 6 October. Israel — 6 October 2012, 10:00am local time. An unmanned aerial vehicle (UAV) crossed into Israeli airspace, and was intercepted by the IAF. 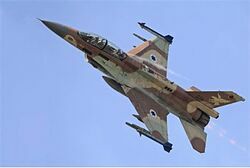 The IDF suspects that the small UAV intercepted Saturday morning by IAF jets over the northern Sinai was launched by Iranian proxy militia Hizbullah. The defense establishment has been looking at the fragments of the UAV, which fell in the area of southern Mount Hevron. According to reports, Israel initially suspected that it was launched from Sinai, but by Saturday evening, military sources said the military investigation showed the UAV had flown southward along Israel’s Mediterranean coast before turning east over Gaza and heading into Israeli airspace. It is believed to have been launched from Lebanon. The IAF’s Aerial Monitoring Unit identified the UAV, which was not armed and probably served only for intelligence purposes – collecting data about IDF bases and the IAF’s operational abilities. Don’t let anyone tell you different: A state of war exists. Prepare yourself for the heretofore unfathomable: The current administration of The United States to a) side with the Muslims, b) not have Israel’s back and c) quite probably order our military to stop Israel from defending herself. Hizbullah, Hamas, Palestinian Authority, Islamic Jihad, Muslim Brotherhood, etc…… They have one thing in common: They’re all typical Muslims, abiding by Qur’an, Sira and Haddith. Israel — 7 October 2012, 11:00am local time. The Air Force carried out “mock raids” at medium altitude over southern Lebanon Sunday, hours after Israel said all indications are that Hizbullah launched a drone that was downed inside Israel on Saturday, according to the Arabic language Nahar newspaper. Israel previously has carried out surveillance flights over southern Lebanon, which is under control of the Hizbullah terrorist organization. Sunday’s flights, which have not been confirmed by Israel, apparently were a response to the drone. Iran’s government-controlled Press TV told Iranians that a former Lebanese general said that drone actually was mistakenly fired by the United States. Mock, schmock…… HIT ‘EM ! Typical Muslims only understand and respect force. As to the accusation El Guapo and the Totalitarians ordered a drone flyover of Israel…… A big part of me knows – not thinks, knows that’s a definite possibility and has probably already occurred more than once, given that the political winds have shifted in a ugly direction. This entry was posted on Saturday, October 6th, 2012 at 16:45 and is filed under Main Postings, The Constitutional Watch, The Media, The Second Amendment To The Constitution Of The United States..	You can follow any responses to this entry through the RSS 2.0 feed. You can skip to the end and leave a response. Pinging is currently not allowed. It’s on the cards now Kenny. All Hell could break loose any day now. Obama means he is stabbing Israel in the back, dontcha know that ? Looks like Iran, via their proxy Hisbollah are testing Israel’s defenses and readiness. I sure hope Barak and Bibi are on the ball, because I sense Iran will strike first. Crazy is as Crazy is. Apparently PM Netanyahu and Ehud Barak are not speaking to each other. Bibi wants to defend Israel and the Jewish people and Ehud has gone over the dhimmi edge. Are we having fun yet ? Gotta say though, that was some great shooting. This could just be the start of the hostilities, opening shots like. Yeah, I heard the same thing about Ehud. I wish the jihadis were animals. They’d be more civilized and reasonable that way. The comments on the video are interesting. The jihadis and their willing minions come out in force and throw around the weirdest crap. Some idiot claims that Israel has killed more people than Hitler, Stalin and Mao combined. If that was true, there would be no islamo-fascist countries surrounding Israel. Waiting = Playing with (literally) radioactive fire. Thing is, if Israel does what has to be done, it’s a real strong bet that #HeilObama will order, or at least try to order our military to stop Israel in it’s tracks. We’re at that point where the election here may not matter, because there’s 74 days between then and Inauguration Day — That’s more than enough time for World War IV to start and finish a thousand times over. Add/edit……… As for Peres, he can go spit up a rope. But regarding Ms. Yakimovich, she scares the hell out of me. She’s exactly like our dearly beloved current Secretary Of State / former co-president. Yep……… and scarier still is if good ‘ol Tzipi and Lil’ Miss Shelley settle their (very few) differences and hook up as one to take down those who would save the Jewish state and people, things in Israel could instantly ignite from within. Are the people of Israel really THAT stupid and suicidal to allow a criminal like Olmert back in ?